The three-increment EHF Satcom program is part of an ongoing effort by the Air Force and Northrop Grumman to modernize the B-2 to keep it fully mission capable against evolving enemy threats. Northrop Grumman has begun flight testing the new computing hardware and communications infrastructure that will eventually allow the B-2 stealth bomber to send and receive battlefield information by satellite more than 100 times faster than today. 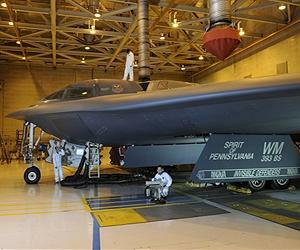 Since Sept. 1, the company has conducted a series of test flights using a B-2 test aircraft stationed at Edwards Air Force Base, Calif. The flight test program is part of Increment 1 of the U.S. Air Force's B-2 extremely high frequency (EHF) satellite communications program. Northrop Grumman is the Air Force's prime contractor for the B-2 Spirit, the flagship of the nation's long range strike arsenal, and one of the world's most survivable aircraft systems. The B-2 is the only combat-proven stealth platform in the current U.S. inventory. "The flight test program has demonstrated that the EHF Increment 1 computer upgrade system has reached a maturity level that allows us to conduct test sorties beyond the Edwards AFB local area with confidence," said Ron Naylor, Northrop Grumman's director of the EHF Increment 1 development program. "It also adds momentum to our efforts to give the B-2 the high speed data handling infrastructure it will need for critical communications and weapons delivery upgrades in the future." Naylor attributes the success of the test flight program, in part, to the Northrop Grumman ground crews that helped perform the pre-flight checkout and maintenance on the B-2 test aircraft. "Collaborating with the Air Force will allow us to increase the tempo and frequency of B-2 sorties from Edwards," explains Naylor, "which will also help the company speed the rate at which new capabilities for the B-2 can be made available for the warfighter." A network of fiber optic cable that will support the high speed data transfers within the aircraft. Increment 2 involves installation of a new communications terminal and new antennas that will allow the B-2 to transmit and receive information securely via satellite. Increment 3 will integrate the B-2 into the U.S. Department of Defense's Global Information Grid, a worldwide network of information systems, processes and personnel involved in collecting, storing, managing and disseminating information on demand to warfighters, policy makers and military support personnel.